TORONTO, Ontario -- On May 12, 2015 we held our Annual General Meeting. In this meeting we elected our Executive Committee of Officers and Member-at-Large positions for the 2015/2016 season. We are very pleased that the nominated slate for the Executive Committee was elected by the membership. We also carried a motion to update our current by-laws to change the number of Member-at-Large positions on the Executive Committee from 6 people to include anywhere from 4 to 8 people. We believe that this change will assist the Officers in conducting Chapter business and will enable us to improve the level of service that we can provide to our membership, through engaging more members of our Chapter in the Executive Committee. SFPE International Members – Please consider participating in SFPE’s 2015 online Constitution & Bylaws revision ballot. A ballot was sent automatically to all SFPE International members of record as of the date of the ballot’s release. Voting is open between April 16th, 2015 – June 14th, 2015 at 10:00 p.m. Eastern Time in the United States. To review a copy of the revised Constitution & Bylaws document, please click here. To review the FAQs about the changes, please click here. Fire and Evacuation Modelling Workshops will be hosted by Thunderhead Engineering in Toronto May 11-15, 2015. Workshops will include topics in: FDS and PyroSim, FDS/PyroSim Distance Education and Pathfinder. Please see the attached notice for more information and pricing. The University of Waterloo Fire Safety Program has recently released their upcoming course schedule. The program is catered to recent engineering graduates and experienced architects, engineers, building consultants and regulatory officials. See the attached notice or the program website (https://uwaterloo.ca/fire-research-and-safety/fire-safety-program) for information on program offerings, course dates and schedules. The School of Fire Protection and Seneca Fire Protection Student Association (FPSA) invites SFPE members to attend their 4th Annual Fire Protection Career Fair and Networking Dinner on Thursday, March 26th, 2015. This day and evening will be a perfect opportunity for individuals in the fire protection / life safety industry and future graduates from Seneca’s Fire Protection Engineering Technician and Technology programs to connect, discuss industry needs, then enjoy a casual dinner. Gary Jarrett, Assistant Division Chief, Fire Prevention, Brampton Fire and Emergency Services, will discuss the current challenges and issues facing the fire service in areas of fire prevention, fire inspection, and current fire code changes with respect to vulnerable occupancies. Cathy Robertson, Captain, Fire Prevention Professional Legal Section, Fire prevention, Toronto Fire Services, will discuss the legal aspects of the fire code, and the process inspection and subsequent charges being filed. The FIRE career fair begins at 1:00 PM until 4:00 PM. The evening begins at 5:00 PM with dinner being served at 6:00 PM. This event is proudly brought to you by the Seneca College School of Fire Protection, Seneca Alumni, with the additional support of CFSA (Student Chapter), CFAA, CASA, SSF, OACETT and National Engineering Month. SFPE members are invited to attend the Canadian Association of Fire Investigators' upcoming seminar concentrating on Commercial Kitchen Fires and NFPA 96. The seminar will take place from April 7th to 9th, 2015 at Niagara Falls, ON. The seminar will cover regulations, safety requirements, hazards, fire causes, suppression systems and case studies. Lecturers include the Ontario Fire College instructors, ESA and TSSA and others. For more information, see CAFI's registration page. Please feel free to pass this information on to any of your colleagues who may be interested in attending the seminar. SFPE International is now accepting educational presentation abstracts for its two-day North America Conference & Expo: Freedom to Design. The conference will showcase advanced and cutting-edge practices in fire protection engineering that are used to protect people, property and the environment from fire. We invite you to share your knowledge with your peers on the advances in fire protection engineering as a presenter, November 9 - 11, 2015 at the Loews Hotel, Philadelphia, PA. Presentations must be noncommercial in nature with no specific brand names mentioned. The 2015 Conference Program Committee, co-chaired by Michael Madden & Michael Venneri, will review all abstracts and make final speaker selections based on level of innovation, quality, relevance, focus, practical application, and timeliness. Deadline for abstract submission is March 13, 2015. For more information and guidelines, please click here. Completed abstracts should be sent to Melissa Franco and include “2015 SFPE Conference & Expo” in the subject line of the email. If you have any further questions, please feel free to contact Melissa Franco, Marketing & Meetings Manager, at mfranco@sfpe.org or 301-915-9724. SFPE International is now accepting presentation abstracts for its two-day European Conference held in Copenhagen, 4-5 June 2015. The conference will showcase advanced and cutting-edge practices in fire protection engineering that are used to protect people, property and the environment from fire. We invite you to share your knowledge with your peers on the advances in fire protection engineering as a presenter. Presentations must be noncommercial in nature with no specific brand names mentioned. The 2015 Conference Program Committee will review all abstracts and make final speaker selections based on level of innovation, quality, relevance, focus, practical application, and timeliness. More information can be found in the attached document. Deadline for abstract submission is 13 February 2015. Complete the abstract guidelines form here. Completed form should be sent to Melissa Franco and include “2015 SFPE Europe Conference” in the subject line of the email. 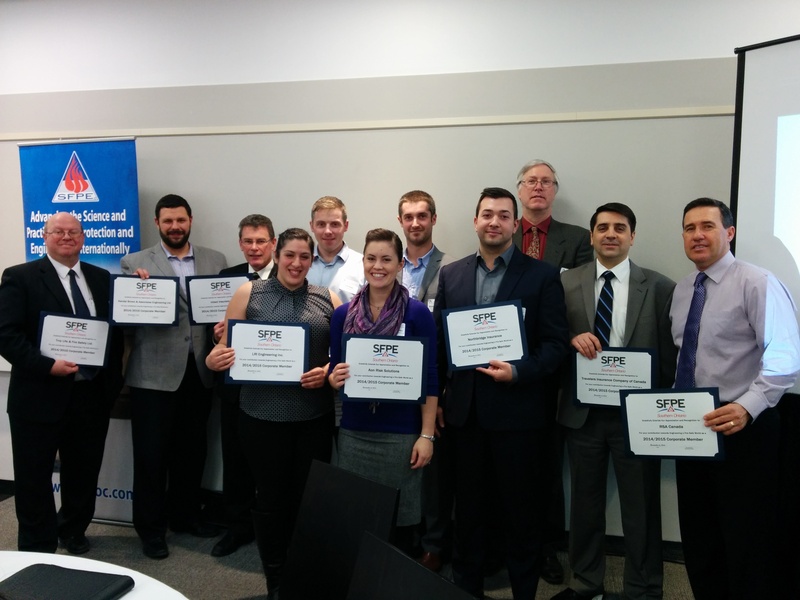 TORONTO, Ontario -- On December 9th, 2014, the Southern Ontario Chapter recognized their newest Past-President and their Corporate Members prior to their Lunch & Learn event. They also made a sizable contribution to the Thomas Chiang Memorial Award. The Chapter was delighted to recognize Edward Koe for his many years of involvement on the Chapter's Executive Committee and his contributions to the Chapter. "We are pleased to continue to have the opportunity to work with Ed in his roll on the committee as our Past-President" said Melinda Amador, Chapter President. 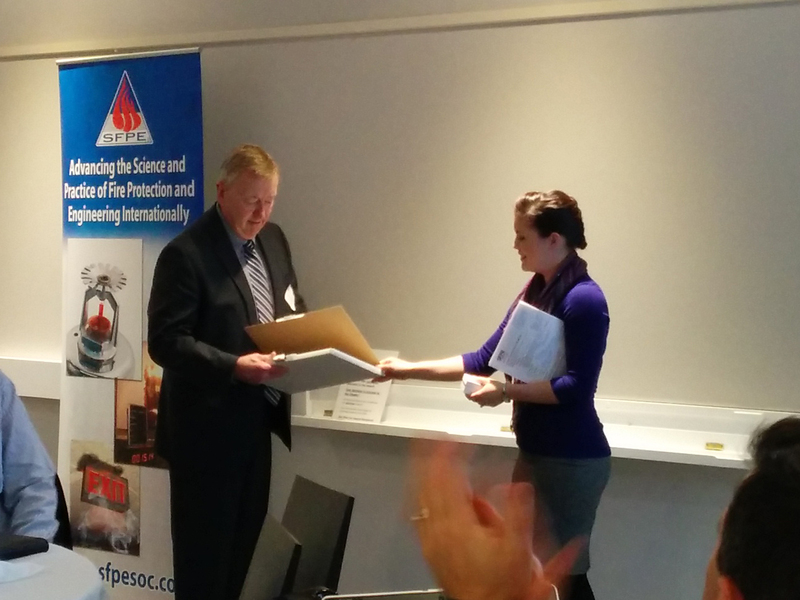 Ed was awarded with a commemorative SFPE President’s Pin and a plaque recognizing his contributions the Chapter. Thank you Ed! The Chapter also took the opportunity to thank their eighteen Corporate Members for their continuous support towards promoting the fire protection engineering agenda. "It was a pleasure to honour each of our members with their certificates at our December 2014 meeting" said Paul Johnston, Membership Chair. "Without their support we wouldn't be as strong as we are today, and as Membership Chair, and on behalf of the Southern Ontario Chapter of the Society of Fire Protection Engineers Executive Board, we thank you." Finally, the Chapter was delighted to make a significant contribution towards the Thomas Chiang Memorial Award. The contribution was made possible through the generosity of our members and guests attending the December Lunch & Learn event. 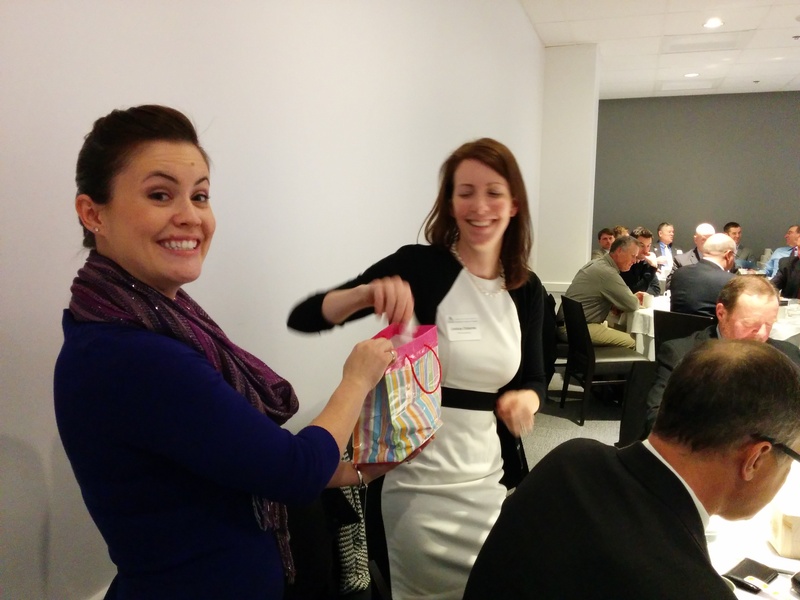 Attendees of the event participated in the Chapter's annual 50/50 draw raising $130 towards the award. The winner of the draw, Domingos Lopes, went on to donate his $130 winnings to the award to bring the total contribution to the award to $260!! The Chapter has raised $435 so far this season and will match all donations received. The winners of the award, who are deserving students pursuing an education in Fire Protection, will be announced in May. SFPE's Dr. Guylène Proulx Scholarship! Attention Members! SFPE International’s Educational & Scientific Foundation Board of Governors makes numerous scholarships and awards available each year. The Dr. Guylène Proulx Scholarship provides at least one recipient with up to $5,000.00 annually. The scholarship is awarded to an undergraduate or graduate student undertaking a research project in the field of human factors or human behaviour related to fire or emergencies. As described on the SFPE website, Dr. Guylène Proulx was an outstanding researcher in human factors and human behavior related to fire. She received her Ph.D. in architectural planning/environmental psychology from the Université de Montréal in 1992, following which she joined the Institute for Research in Construction, National Research Council Canada (NRC) to conduct research in human factors related to fire. For that research, she received international acclaim from all of the diverse interests in the fire safety community. This scholarship honors her legacy by building on the research in her chosen profession. Applications are required to be received by December 31, 2014 to be eligible for review by the international panel. Please consider if you or your colleagues may be eligible to apply for this scholarship, or others made available by SFPE International.